Facebook-owned WhatsApp has brought a revolution in the world of communication. Using just one app now you can send text messages, photographs, videos, GIF's, documents and much more to another person. The company even announced several popular business tools in an effort to catch up with the competitors. WhatsApp has also associated itself with several banks to send banking messages to the bank customers who use Whatsapp and are ready for this mode of communication. Now, that we know that this powerful tool is changing the world we live in, there are certain nuts and bolts of this technology that needs to be explored. One of the most tedious tasks is to send a message to someone whose number is not saved in your phonebook list, but now you can say adieu to the rote technology and send WhatsApp messages without saving numbers to your contact book. 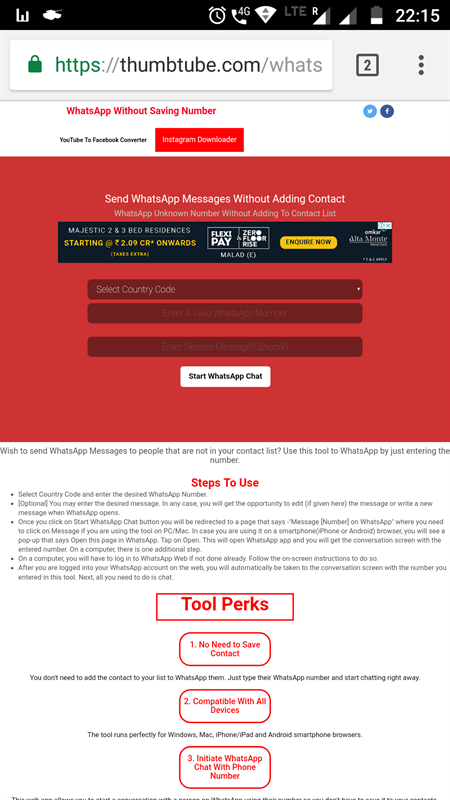 Well, the tool for sending Whatsapp message without saving number online/web app can be found here. Thumbtube hosts several web apps one of which is for sending Whatsapp messages without saving the number to your phone book. Step 1- You can use PC or Mac browser too to open this tool and send messages via WhatsApp Web or Desktop app. In this article we will be using our mobile to test this tool. So, first click on the link above using your mobile web browser to open this tool. Step 2-You should now be able to see the page like below. You need to fill the details like the country code, enter a valid WhatsApp number and the text message that you wish to send. Now, you can start texting your friends without any second thought. Step 4- Once you have filled the details, a pop-up window screen will appear that will confirm whether you wish to send the message to that particular number or not. Click on the send button. 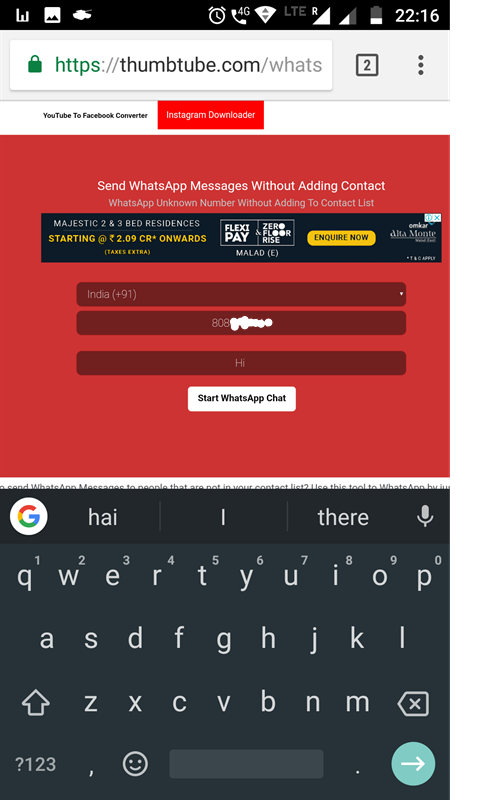 Step 5-Once the submit button is clicked, you will be redirected to your WhatsApp app which the message screen to the particular recipient you wanted to contact. 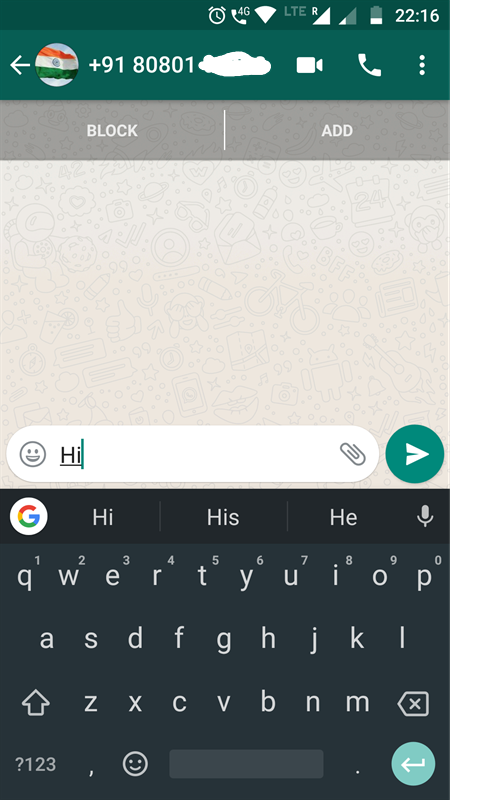 Now you can send messages, images, videos, location or whatever normal WhatsApp conversation allows you to do. No need to add the phone number- As said above, the user doesn't need to add the phone number to his/her contact list before sending WhatsApp message. Just type their WhatsApp number and start texting them straight away. Initiate the chat with a phone number- say adieu to the cumbersome world of technology and say hello to the world enriched with simple and idealistic technology. This tool is a perfect example of it. Just type the phone number and start your conversation right away. This tool will definitely add volumes to your conversation with new people because now you don't need to follow the traditional procedure, all you need to do is to just type the message and start chatting with your friends or a potential business. That's what we call revolutionary.